Now all you have to do is put it together and send it along. Hopefully, the payment comes back shortly and your bank account is a little richer (until tax time!). If you agree on pay rate based on project then the invoice is super simple as it will be one line item: ‘this is my project that I did for you and here’s how much we agreed I would be paid’. Send that in. Get paid. Fist pump! I recently did a project where my contract was hourly. This was a first for me so I had to figure out a different way of writing up my invoice. I used Excel because: free! Obviously, if you have software for your accounting then you can figure out how to use that for an invoice. My Excel template took a little bit of finagling to calculate the dollar amount based on hh:mm in the time column, but once I had that set up, I could track my rate down to the minute. 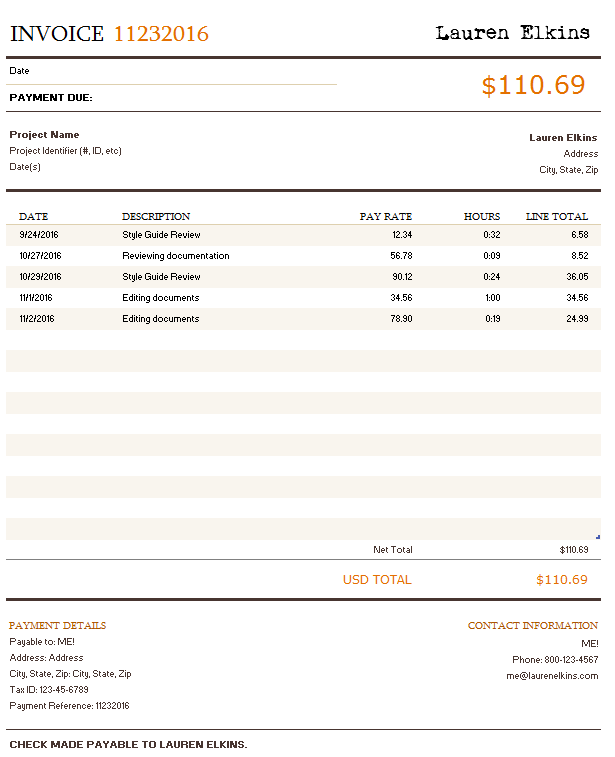 If that’s not in your wheelhouse, then feel free to download my template example and set it up for your own needs: Lauren Elkins’s Hourly Invoice Template. You’re welcome! So how did I know to the minute how much work I did on each day? I use a really simple (and free!) time tracking tool: TopTracker. With it, I track both my hourly and project work. I don’t need it for invoices with project work, but I do want to know if I’m getting better with managing my time so that I’m making more per hour or minute with each project. That’s how I make more money, which is just one of my many goals as a freelancer. Once I’ve completed a project, I can use TopTracker to generate a csv file with my tracked time each day. Then I write that up in my invoice and send it along. I also enter information into Quicken to keep track of my books using that software, but I despise their invoices. Hence creating my own in Excel. Hope this was helpful for you. Now, go and freelance your way to riches and power! ← Sweet Christmas gifts for the writer in your life!